Much of American history goes untold throughout middle school and high school history courses. The pieces of American immigration history that are presented, often do not depict the experiences of many groups of people. The pervasive racism that was key in the construction of immigration law and policy continues to be glossed over. It is obscured by more palatable historical narratives like “the melting pot." The “the melting pot” metaphor was popularized by the 1908 play, The Melting Pot, by Israel Zangwill. Israel Zangwill was an opponent to the raging nativism and anti-Semitism that ran wild in American society. Per Jean Costanza Miller, the melting pot came to be a prominent symbol of ethnic assimilation in American society and more recently of cultural pluralism. Historical immigration symbols that represent the U.S. as a welcoming and inclusive country, such as the melting pot metaphor, obscure both the historical and contemporary reality of an unjust American immigration system that continues to privilege certain groups of people. 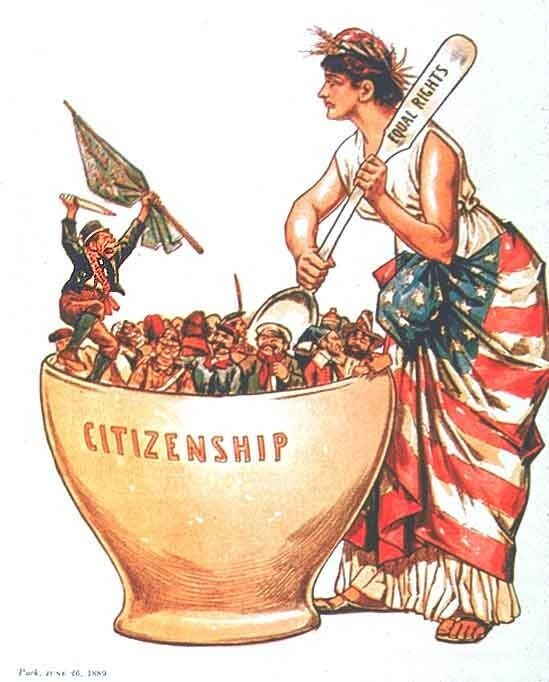 The notions of cultural assimilation and pluralism that the melting pot metaphor perpetuates ignores the racially selective immigration policy of the late nineteenth century, to the mid-twentieth century (1880-1950). Immigrants have been excluded in immigration policy on the basis of their race, gender, sexuality, ability, and religion since the conception of the US. In his book, White by Law, scholar Ian Haney López outlines the history of immigration and naturalization and argues that race is socially constructed and legally produced. He states that up until a generation ago, being white was a prerequisite for gaining citizenship. Discrimination created, informed, and ran the immigration system. From 1790-1870 only free white immigrants were eligible for citizenship. The Chinese Exclusion Act of 1882 and the Immigration Act of 1917 served to exclude Chinese and later all Asian immigrants based on notions of racial inferiority. In her book, At America’s Gates, historian Erika Lee examines the creation of the gate keeper state during the Chinese Exclusion era and the racist ideology that supported it. She describes the gate keeper state as the state and federal efforts to restrict and control who can immigrate to the U.S. The object of the gate keeping state is to keep out those who are racialized to be inferior and unassimilable. In her work, she describes the Chinese Exclusion as foundational in the creation of laws that still are used to contain undesirable immigrants. For example, the Immigration Act legalized restriction with the use of 1917 required literacy tests, US passports, the creation of categories of people who were inadmissible for naturalization based on race, class, and gender, and it legalized deportation. The underlying ideology of the gate keeper state is based on the racialization of Chinese immigrants as inferior, underserving, unassimilable, illegal, and criminal breathed life into these policies. 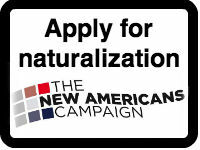 Southern and Eastern Europeans, specifically Italians, Irish, Jews, and Catholics, were also systematically excluded and racialized in the U.S. immigration system (Ngai, 1999). Historian Mae Ngai, in her piece, “The Architecture of Race in American Immigration Law: A Reexamination of the Immigration Act of 1924,” examines how the 1924 immigration statute furthered the construction of race and nationality. The Immigration Act of 1924 designated quotas based on national origin. These quotas restricted immigration from certain countries while increasing it from others. Immigration was restricted to 150,000 people a year. The allotment of the quota was based on the countries that Americans traced their origins to. A central goal of the act was to limit immigration from Eastern and Southern Europe. The law additionally solidified the concept from the Asiatic exclusion of “ineligibility to citizenship.” The census that created the quota for each country, excluded the descendants of Natives, African Americans (both of which are not immigrants to the U.S.), Chinese, Japanese, and South Asians. Chinese, Japanese, and South Asians because they were deemed ineligible for citizenship. This gave them the smallest quota of hundred people per year. Omitting “undesirable people” from the census created more quota slots for desirable Europeans . Although many of the same racialized notions of undesirability trailed Southern and Eastern Europeans, they were still able to attain citizenship due to their eligibility as white persons. Furthermore, Nordic whites were welcomed, non-Nordic whites could assimilate, and those who were deemed not white were barred from the melting pot. One might counter this history with the argument that the immigration system is not discriminatory anymore and that the melting pot metaphor is now fitting. It now welcomes all immigrants and admits them unbiasedly. Chinese Exclusion, the Immigration law of 1917, and the Immigration law of 1924 were eliminated by the mid-twentieth century. Whiteness is no longer a prerequisite for citizenship. Any immigrant is now welcomed in to the US. Unfortunately, U.S. immigration laws are far from unbiased and welcoming. These laws left in their wake an innately discriminatory immigration system. Present day laws are rooted in immigration policy from the past. The creation of border patrol, literacy tests, deportation, which are all still apart of immigration law, are still used to exclude people from the immigration system. Not only did these laws help construct whiteness, they continue to racialize people. Immigration laws are facially neutral but still function out of that same notions of racism and nativism. The use of the melting pot metaphor as symbol of assimilation and cultural pluralism continues misrepresent the experience of immigrants. In many ways, immigration policy continues to mirror that of the past. A stark example of discrimination within contemporary immigration law is the Muslim Ban that occurred in 2017. On January 27, 2017 the Trump administration enacted a travel ban on Iran, Iraq, Syria, Sudan, Libya, Yemen, and Somalia, that denied people from these countries entry into the U.S. for 90 days. This order suspended the entire U.S. refugee admission system for 120 days, suspended the Syrian refugee program, temporarily banned entry of dual-nationals who are from those seven countries, and lowered the total number of refugees to be accepted from any country for 2017. Priority of entry was given to religious minorities, such as Christians in Syria. The administration declared that this was to prevent domestic terrorism and secure the U.S. borders. However, the US has good relations with many of these countries; they were banned because they are Muslim majority countries that are said to pose a security threat. This ban religiously and racially profiles people; a form of discrimination that was vindicated in the name of security. The racialized notions that endorsed the Muslim ban share a blatant resemblance to the ideologies that thrived during Chinese Exclusion and the 1924 Immigration Act. The islamophobia and nativism that continues to penetrate American society today casts Muslim and Arab people as undeserving, innately criminal, and unassimilable. The same racist ideologies that painted Chinese immigrants as inferior and homogenous, are being used to again in immigration law to exclude and target the Arab and Muslim population. Akin to past immigration policy, the travel ban restricted people on the basis their race, nationality, and religion. An added layer of complexity to the travel ban is the conflation of race and religion that it assumes. This conflation echoes the experience of Jewish immigrants during the immigration policy of 1924. This legislation illuminates the power systems that continue to guide the US immigration policy and persecute minorities. The melting pot remains to be unavailable for groups of people because racist ideals still permeate through American society and law. The melting pot metaphor does not reflect the experiences of immigrants in the immigration system. The play, The Melting Pot, tells the story of a Russian Jewish immigrant family that flees Russia to escape the anti-Semitic pogroms. The family comes to the US in hopes of living in a society that is free from violent racism and ant-Semitism. Upon their arrival, they find themselves in the midst of an anti-Semitic society. During the showing of this play, the Immigration Act of 1924 was restricting the entry of Southern and Eastern Europeans, many of which were Jewish. This play was in response to discrimination that many immigrants faced. The reality of immigrants who were deemed not white was exclusion and abuse. This play represents the dreams of inclusion of immigrants, not their lived reality. The assimilation and cultural pluralism that the metaphor promised, was not offered to those who were thought to be inferior. 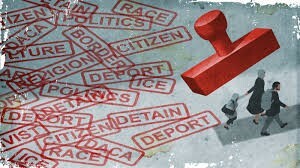 Current immigration laws reflect those of the past and continue to exclude people based on notions of white supremacy. Immigration law has been used to reinforce the existing racial hierarchy in the US. The metaphorical narratives of the melting pot cloud peoples' present understanding of immigration. Education is key to combating these narratives and future injustices, like the Muslim ban.